This is not your typical Ghibli film, in some ways … though in other ways (particularly if you know and love the “Ghiblies” shorts, as I do), it fits right in. It feels like Ghibli, with its slow, nostalgic pacing. But it’s far more subdued than much of Ghibli’s work. It’s a rather silly film. I don’t quite know what to make of it. Well, this blog is really getting somewhere now, isn’t it? Uhm, so … yeah, as you can tell, I really don’t have much to say about it. I couldn’t find an English dub version (though I know that one exists — with Jim Belushi and David Ogden Stiers, so it’s probably awesome!). The music is decent. The animation is pleasing, if not impressive. 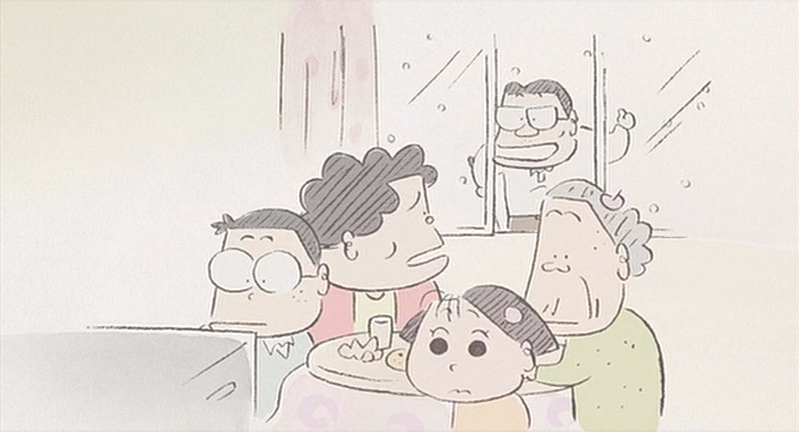 Once again, I find Isao Takahata’s range both surprising and bizarre. It’s baffling to think that the same man directed Grave of the Fireflies, Only Yesterday, Pom Poko, AND My Neighbors the Yamadas. What an odd mix of styles and content (and quality, of which at least one of those films is significantly lacking). It’s the story of a family, told in snippets. The characters are endearing at times, annoying at others. Each little short is pleasant in its own right, and there’s a subtle humor laced throughout that I find particularly enjoyable. Still, two whole hours of these quirky shorts easily becomes tiresome. Pros: Good music, Delightful atmosphere reminiscent of Ghiblies 1&2, Subtle and quirky humor, etc. Cons: Slow to the point of boredom, Not much of an overarching plot, Lackluster animation, etc.